Your people drive your business. The richer your reviews the better your employees' performance. 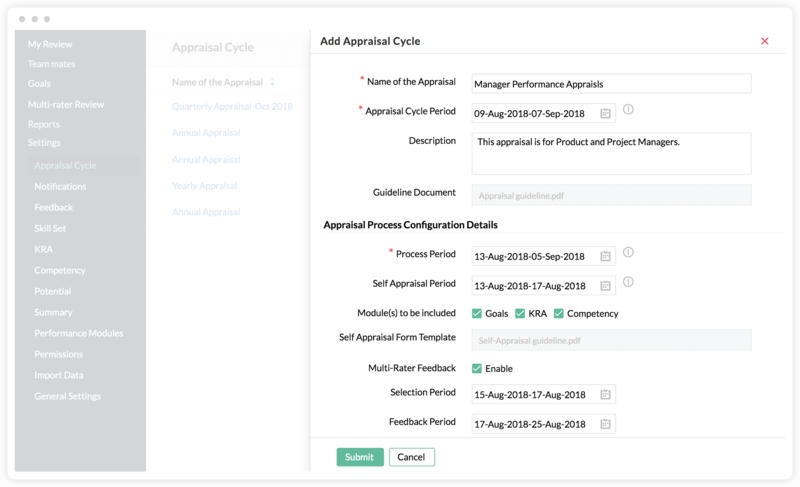 With Zoho People you can have a 360-degree, continuous feedback system and evaluate employees with customized performance appraisal methods. Reviews shouldn't be an once-yearly thing. Let employees review their peers, and be reviewed by them, all through the year. With peer review, managers can quickly gather insights about each member of the team. Also, if employees wish not to reveal their identity, they can choose to give anonymous feedback. Employees work on a number of projects in a given year. 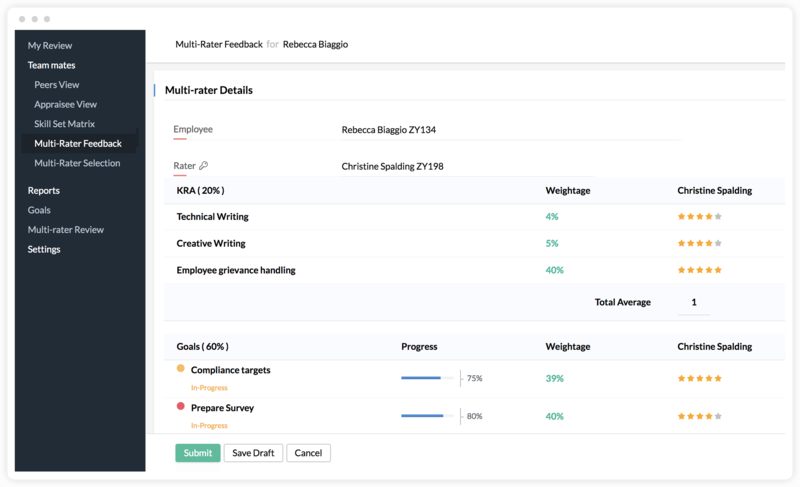 Multi-rater feedback means that even people outside of the operating team can offer their perspective, giving reviewers better insight into the employee's skills and performance. Setting clear objectives helps motivate individuals and organizations to do their best. 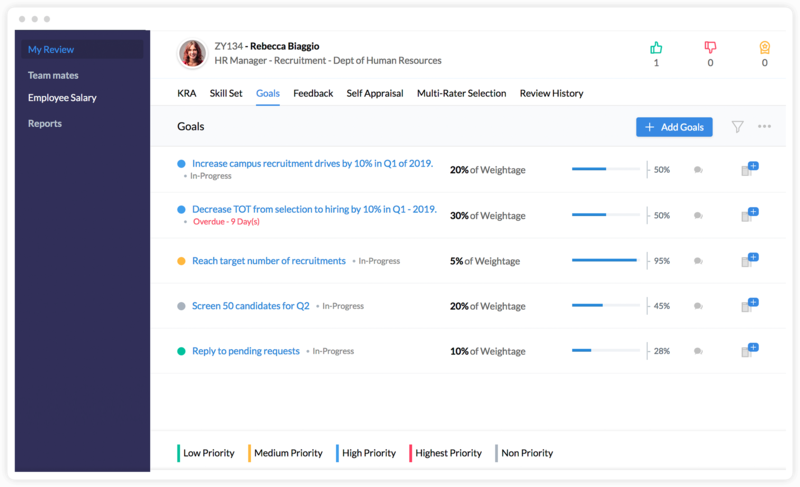 With Zoho People, employees, admins, or managers can set goals and track their progress. 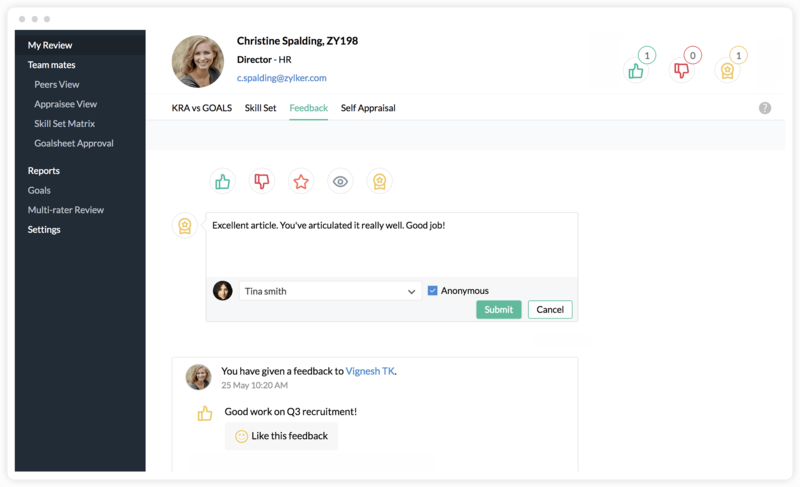 Employees can also get ratings from their managers about completed goals. Make the system yours by customizing your appraisal cycle. With self-appraisal, employees can detail their skills and review their results during each appraisal. You can also have multi-level reviewers and make sure all the reporting heads give their reviews. Once you've consolidated the performance reports, you can complete them with a single click. With Zoho People, you can tag the skills required for various jobs and allow employees to highlight their own skill sets. You'll be able to utilize the most proficient employees for a given project, eliminating the need for a tedious search. Key Resulting Areas (KRA) can be effectively used alongside goals and skill sets to assess employee performance. In Zoho People, managers or employees can tag KRAs, set a value, associate them with achievable goals or jobs, and monitor the progress. Competency ratings give you a leg up in evaluating your employees. Tag the qualities that a particular designation, role, or department should have, and make sure that you don't miss out on the employees that have those skills. 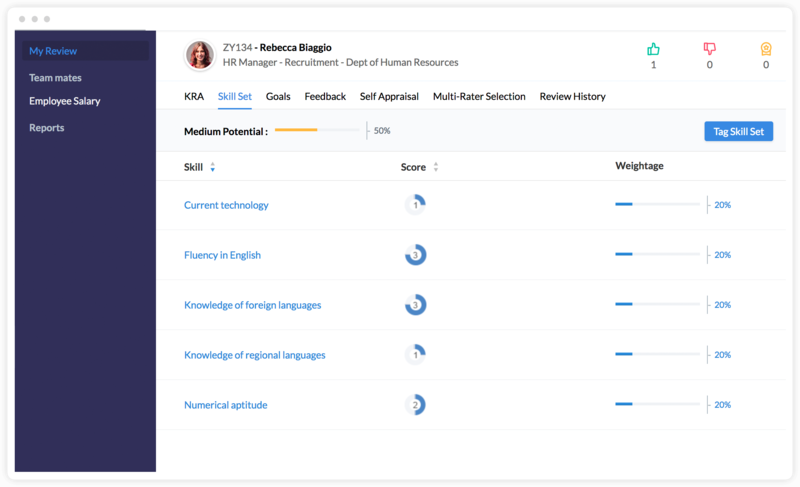 Use our powerful analytical features to evaluate employee performance and identify areas for improvement. 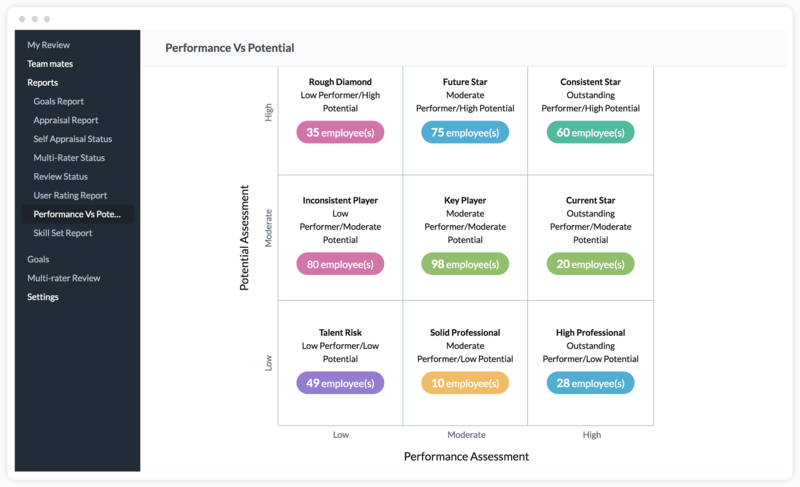 The skill-set matrix and 9-box model reports help you see the talent, the potential, and the performance of your team at a glance.